That’s also what I was thinking, Paul. I just wanted to mention it and get your opinion to confirm. Thanks again for your help with this issue! Parts are ordered and should be on their way soon! Fabrication would be quite expensive. 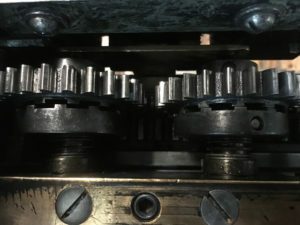 Should I also replace the clutch block and gear for the roller making the chattering? The corners of the crenelations are beginning to round from banging into one another. Thanks so much for getting back to me so quickly! I understand what needs done and I will get the parts ordered from NA Graphics. I will also contact the local machinist who has helped us out with some other press issues. If he cannot help, than I will get a hold of you to swap the clutch plates. Thanks again! 1) Braze the brass clutch plate to fill in the divots, then polish. A local machine shop can do this. If not, I have refurbish one but need to your in exchange to continue the cycle. 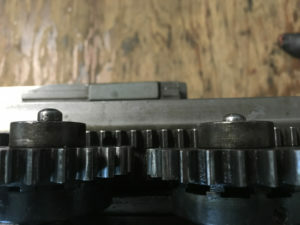 2) Replace the clutch pins (MR-110) in the ends of the form roller cores. These are available from NA Graphics. 3) Clean all parts , including the hole in the cores, bearing bars, screws, and the form roller frame. 4) Lightly lubricate all parts with SAE 20 oil, except for the clutch pins where you should use graphite. 5) When reinstalling make sure that the gear collar (MR-112) is flush with the end of the core. 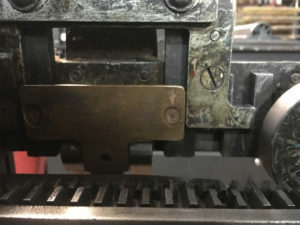 6) Remove excess shims between the form roller rack the cam (MS-264). See manual Sheet 107.